The content creator market is maturing and growing. Bigger and more established companies are beginning to see the value in investing in the space, and nowhere was that more apparent than at TwitchCon 2016. For the second annual event, TwitchCon relocated to San Diego and we began to see Amazon’s impact on Twitch start to take shape for the first time. Below are three observations on how the future of Twitch will be impacted by Amazon. Second, Amazon has started positioning Twitch as a digital game storefront with Steam-like functionality by introducing a “Game Details” page and supporting Twitch Launcher software. 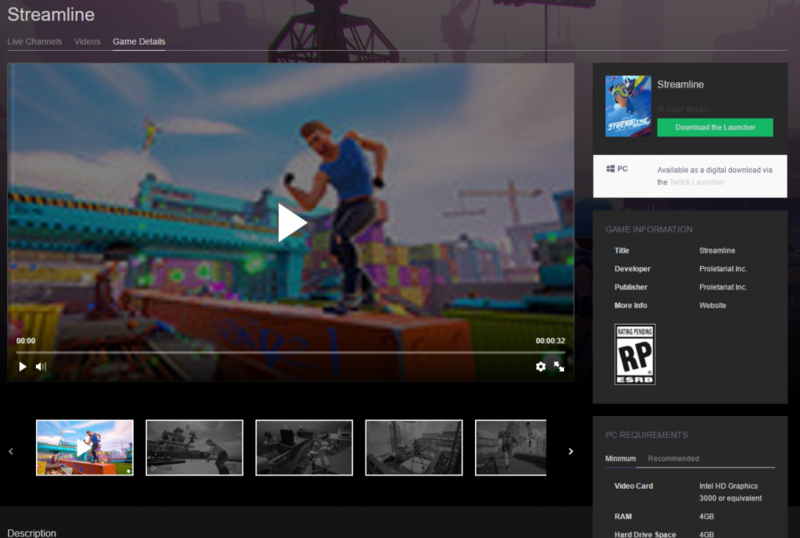 Amazon first introduced this new functionality by including a copy of Streamline in Amazon’s Twitch Prime service. The “Game Details” page is just an addition to the page that each game already has in the Twitch directory. This page contains screenshots, a trailer, and a download/purchase link. Once downloaded, the new game can be accessed and managed in Twitch Launcher. This new functionality will make for an interesting customer browsing experience, as they have immediate access to see who is streaming it or who has made videos of the game. Additionally, when a Twitch Partner streams a game that is a part of this system, they get a referral link that their viewers can use to go purchase the game. Twitch incentivizes the streamer to participate by giving them a 30% cut of each sale. Right now, the only game in this system is Streamline but there is no doubt more will be added. Finally, Amazon hosted a launch party for their new game studio’s first titles: Breakaway, a “mythological sport brawler,” New World, and Crucible, that will surely set the tone for how other gaming companies participate in the event. Of course, all three titles have promised a high level of Twitch integration such as the announced Stream+ feature, which has similar functionality to Proletariat Inc’s Streamote.tv. Amazon’s launch party was experience-oriented and put the games front and center with attendees, offering demo access and alpha codes (etched on heavy metal coins, no less). It‘s quite clear that Amazon plans to use their purchase of Twitch to further their initiatives, which is great for gamers and content creators. Amazon seems keen to make use of Twitch streamers’ influence on their viewers to create a store/publishing platform. How this plays out in a Steam-centric world will be interesting. Any more methods they can create or provide for Streamers to monetize their shows, in a way that benefits viewers, is great for the market as well. In short, TwitchCon provided us with plenty of evidence to be optimistic about what Amazon will be bringing to Twitch in the future.